NASA astronaut Mike Fossum, Russian cosmonaut Sergei Volkov and Japanese astronaut Satoshi Furukawa launched to the International Space Station at 3:12 p.m. CDT Tuesday (2:12 a.m. local time, Wednesday) from the Baikonur Cosmodrome in Kazakhstan. Fossum, Furukawa and Volkov, the Soyuz commander, are scheduled to dock their spacecraft with their new home at 4:22 p.m. Thursday, June 9. They will join Expedition 28 commander Andrey Borisenko and flight engineer Alexander Samokutyaev of the Russian space agency and Ron Garan of NASA. The trio has been aboard the station since April 6. On Thursday, coverage of the Soyuz docking will begin on NASA Television at 3:30 p.m. NASA TV coverage of the hatches opening and the welcoming ceremony aboard the orbiting laboratory will begin at 8:30 p.m. The six-person crew will continue the uninterrupted presence of humans on the station since November 2, 2000, conducting expanded scientific research and station maintenance activities. The station residents also will welcome the crew of the last space shuttle flight, Atlantis' STS-135 mission, targeted to launch July 8. The shuttle will deliver critical supplies in the Italian-built Raffaello multi-purpose logistics module and support spacewalks by Fossum and Garan to retrieve a failed cooling system pump module, which Atlantis will return to Earth for analysis. Garan, Borisenko and Samokutyaev, who launched to the station April 4, will return to Earth in September. Before departing, Borisenko will hand over command of the station to Fossum for Expedition 29, which begins when the Soyuz TMA-21 undocks. NASA astronaut Dan Burbank and Russian cosmonauts Anton Shkaplerov and Anatoly Ivanishin will join Fossum, Volkov and Furukawa to complete the Expedition 29 crew in September. 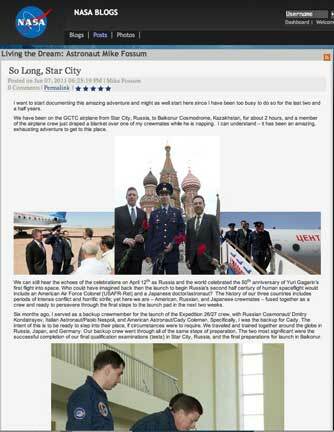 Fossum will blog about his experiences while aboard the space station. His first blog entry will be posted later today at.